An awareness of electrical hazards before they are felt. History of the hard hat. Today’s Safeguard Compass Personal Voltage Detector represents a groundbreaking achievement in Personal Voltage and Current detection. Its small form factor allows the unit to be placed in the user’s peripherals. When an electric current or voltage is detected, Compass immediately triggers an alert. Capitalizing on its advanced sensor technology, the Compass will then provide a directional indication which points the wearer to the approximate direction of the voltage source. In addition to voltage alerts, the Compass is also able to sense and alert its users to hazardous situations involving “current” and “current flow” on conductors and that will help people avoid getting in series with current. Safeguard’s Compass is the world’s first and best directional voltage and current wearable detector! Over the past several years, numerous personal voltage detectors have been developed. While some attach to the user’s hard hat, others were designed to be worn on a lanyard or belt clip. All existing designs rely entirely upon the electric field to detect a voltage. No other wearable product gives a “current-detecting” alert as they are unable to detect magnetic fields. When compared with the other devices on the market, it is safe to say that Safeguard’s Compass is the best personal voltage detector. Electrocution and electrical injuries continue to pose very serious concerns. These accidents continue to be one of the leading causes for all workplace fatalities. Due to the often-unseen nature of voltage and current, contacts are made when the user is unaware of the threat. Abnormal conditions, distraction, and complacency cause many workers to be oblivious at a time when attention to detail is needed the most. When electrical line workers began to work around conductors, these unfortunate contacts have been a steady threat and reality. A common occurrence involves situations where people are climbing structures and poles and, while doing so, make inadvertent contact with the top of their head. The famous founder of the IBEW, lineman Henry Miller, made this type of electrical contact which proved fatal. 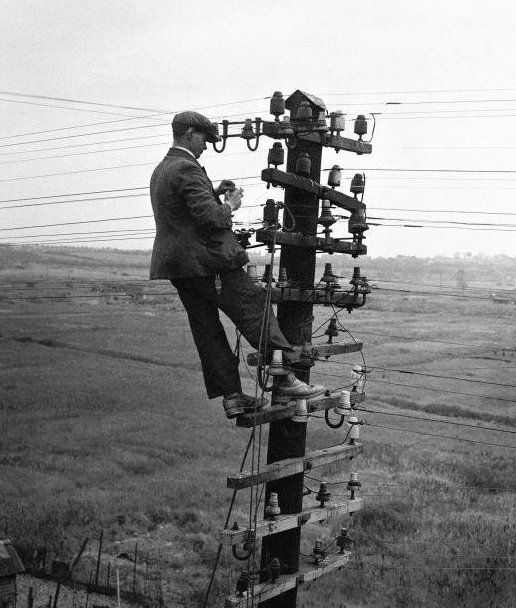 As time went on, line workers quickly realized there needed to be a change. 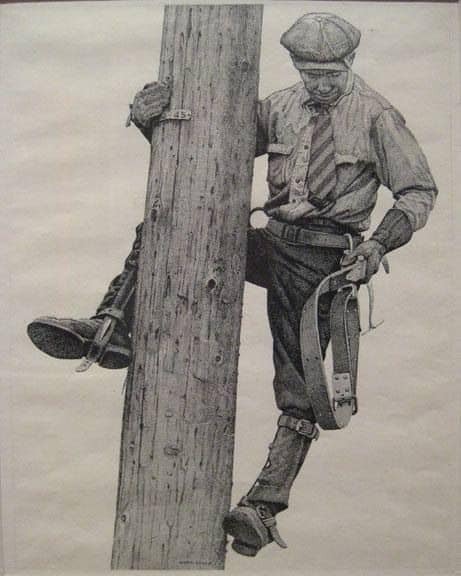 Drawing of Utility Lineman wearing felt hat as protection. At some point, these resourceful line workers realized that a simple felt hat provided a great amount of resistance. Workers began to wear these large felt fedora-style hats and it quickly became a signature piece of apparel for line workers across the industry. With a felt fedora placed squarely on their heads, these workers had a sort of wearable voltage detection device. When a worker lifted their head into a conductor, they would feel the wire through the protection of their felt hat. This gave workers a critical “second chance” as they avoided a potentially deadly threat. Many electrical workers owe their life to this second chance that their felt hat provided them. Incredibly, electrical workers would also use their felt hats as a method to extinguish an arc. During the opening of a switch, if an arc began to travel across the contacts, these electrical workers would quickly remove their fedora and wave it through the arc to interrupt the flow of current! Felt fedoras were not only an early wearable proximity sensor but they also served as a crude load buster. As the amounts of voltage and current stored in our everyday electrical systems increased, the effectiveness of these felt fedoras for these applications quickly decreased. An analysis of electrical accidents made it clear that an improvement was necessary. As a result, the plastic hard hat, providing better electrical properties, was developed. These hard hats have saved numerous lives when a wearer bumped into an electrical conductor. Thankfully, workers today no longer continue the practice of breaking an arc with their headgear. Avoiding electrical contacts has been an ongoing important precaution. From the days of felt hats to our current-day dielectric plastic hard hats, wearing something on the head has helped saved countless lives. With Safeguard’s new Compass personal voltage and current detector, that level of safety awareness has taken a quantum leap. With its adjustable sensitivity, workers can now calibrate their unit to the specific work environment and have a 360-degree field of electrical awareness. Always on, always alert, and always listening… this technology is the latest progression to help reduce electrical catastrophe(s). Electrical workers, engineers, first-responders, and others across the globe are joining the Safeguard Compass revolution. Lives have already been saved and this new personal electrical safety revolution is underway. Contact your distributor, or Safeguard Equipment, today to learn how you can use the industry’s best new wearable electrical safety sensor.